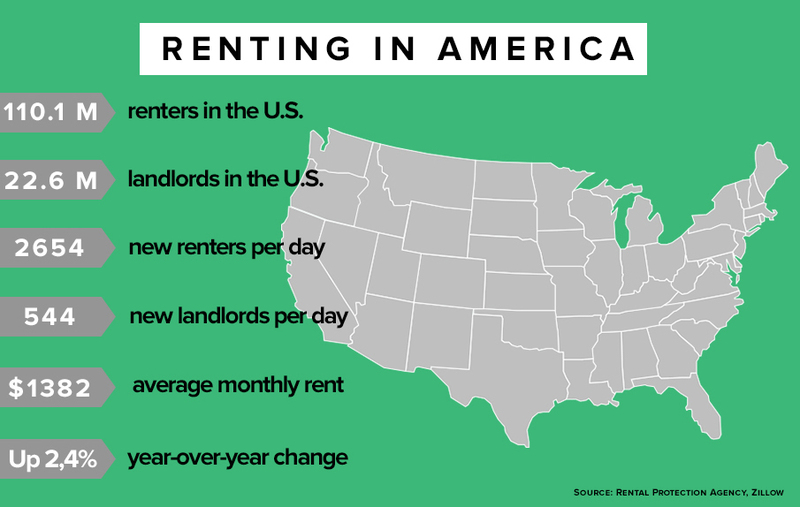 The number of Landlords is growing every day and keeping pace with the number of renters, which has risen steadily since 2007. In general, it’s not an easy task to become a landlord. It is time-consuming and can be stressful if not done right. It’s not a get rich quick scheme, so having a thought out long-term plan is very important. Landlording is a long-term investment that needs to be approached carefully. To help you with one of the best investments in your portfolio, here are our tips that might help you become a successful landlord in 2018. When you decided to become a landlord, you took on a new asset, not a second home. Like every business you need a business plan and that should include protecting that asset, while also utilizing it to it’s fullest in regards to cash flow. Unlike a passive investment a rental requires a little more attention and care. As a landlord you have become a part-time bookkeeper, customer support, maintenance personnel, marketing team, contract specialist and building specialist. This is quite the undertaking, so read on to find out how to make easier. First step is to buy a rental. This is not an easy task and some thought should be put into the rental itself. What property you buy can change the amount of work for you into the future. A single family rental is a great place to start off as a landlord. Typical single family rentals are built for homeowners, so the equipment is usually a little higher quality than that of a duplex or more. Looking for a family friendly neighborhood close to a park is a great thing to sell to prospective tenants because you get both families and single tenants with pets - the more prospective tenants then the faster it is to find the right tenant. Look for low maintenance lawns with trees that are medium height - trees grow fast, so tall trees can cost you thousands to cut when they become a risk for neighbors. Also, try and avoid flat roof homes. Find something with a pitched roof as both sunny and cold regions wear on a flat roof much more than a pitched roof. Screening your tenants credit is interesting, but don’t over value it in comparison to checking up on references from other landlords. Services like RentPrep can provide actually phone calls to previous landlords, so you know exactly how they will treat your rental. Once selected you want to have a relationship with your tenant. Respect their privacy and do not show up at odd hours. Set up an appointment in advance. Though it is an asset for you it is the tenants home and anything can impact their home life, which can cost you money. The average make ready is $1,800, so keeping a tenant as long as possible saves you $1,800. If the tenant has complaints about neighbors or anything else, you should listen and do what you can to help - don’t be indifferent. Same with repairs, set up a time to go and see what’s wrong, (if you have an app that allows picture and video this can be simple). If the repair doesn’t fall into the emergency category, set up a time that works best for you both to return. Tenants will respect you more if you let them know ahead of time when you plan to stop in, and many states require this notice legally. It’s important to customize your lease and make it as clear as possible. This will be the legal document when something goes wrong. The lease should cover more than just rent and due dates. Clarify what type of deposit and how the deposit can be returned. By the way, you might not know that each state has a landlord and tenant act that covers rent, security deposits, landlord and tenant obligations, tenant’s rights, and evictions. You can get a copy from the Department of Housing office in your area, or online at the Department of Housing website for your state. You may want to add additional requirement for things like collecting rent online through a rent collection service (if you use Dwolla or TenatCloud). Use as much detail as possible, like repairs responsibility, late fees, weight limit on pets and even tenants behaviour (no loud music after 8pm or anything like that). Remember, you are paying the mortgage, costs and taxes so set the appropriate rent that will still be fair for your tenants. We already mentioned that being a landlord is not the easiest of businesses. But fortunately there are some super tips that might ease your life. One of them is to use property management software (PMS). It will help keep everything organized and in one place. Most of today’s PMS systems offer you access on all mobile devices. Some can be very easy to use and do most of the work for you. Managing one property is the best way to get used to PMS. Believe us, it will save you both time and money and allow you to provide top end customer service for your tenants. As a modern landlord with end to end solution in your pocket (it’s cloud, so yes, could be in your pocket easily) you will be ready to address any of your rental needs. I would strongly recommend to start with TenantCloud.com, it is free, it provides each landlord with personal website, it has all the necessary tools for a landlord and it is easy to use (check them out on Reviews.com, they rate TenantCloud as the best software for small landlords). Digital maintenance requests, automatic invoicing tenants, online rent collection, marketing and it’s free. Now you know the secret. We really hope that these 5 tips help you on your path to becoming a landlord. But not just a landlord a great one. The first one will set the foundation for you to start buying many more. No better time than the start of a new year to set your business up right. 2018 will be a great year and these tips can help you be a great landlord.